This post is sponsored by Gift Card Mall. Opinions are my own. I love the holidays. 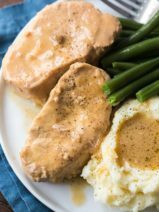 I love the time with my family, the food, the music, and the joy of giving to the people I love. One of my favorite gifts to give during the holidays are gift cards from Gift Card Mall. Whether I’m browsing the Gift Card Mall display at our local grocery store or picking up cards at GiftCardMall.com, I love knowing that I’m putting the power of selection into the hands of the receiver. That said, I also love dressing up gift cards to make them extra special and unique. 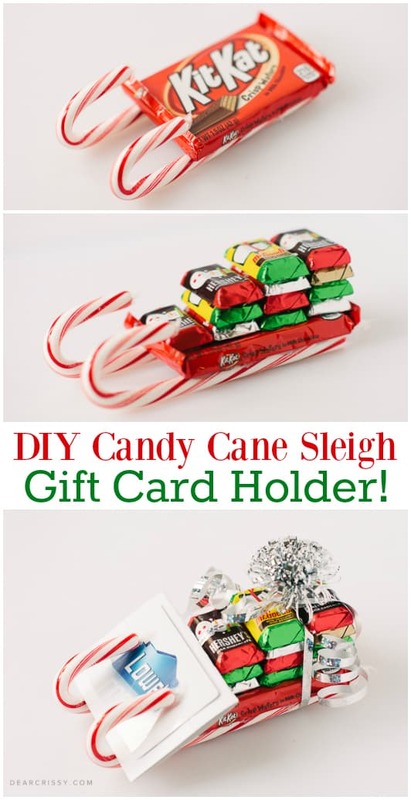 One way I’m doing that this season is with this fun DIY candy cane sleigh gift card holder! 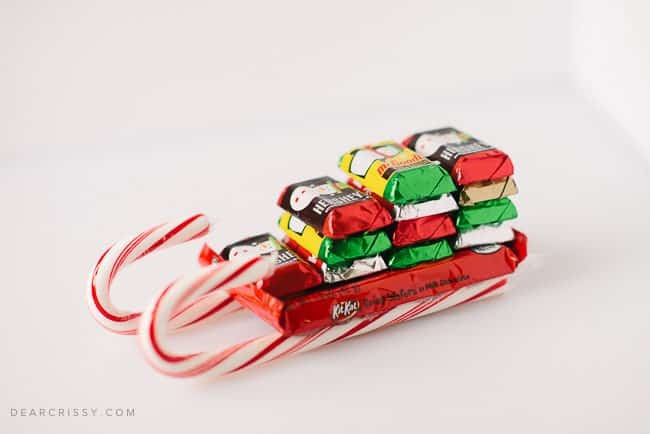 I’ve seen these cute DIY candy cane sleighs on the internet for a few years. I’m not sure whose idea it was originally, but they deserve a medal because how cute are they? 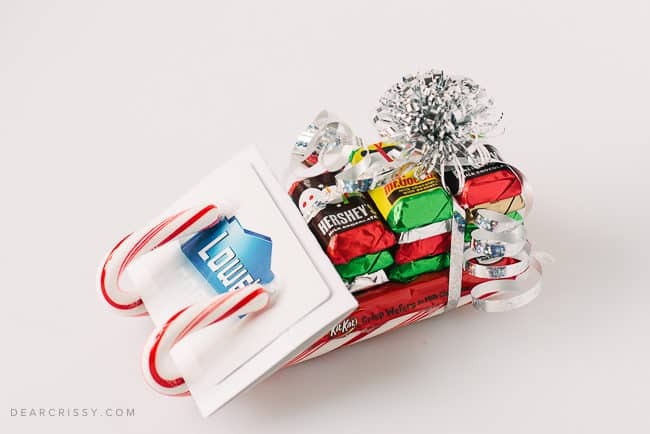 I decided to turn this idea up a level by using my DIY candy cane sleigh as a unique gift card holder. 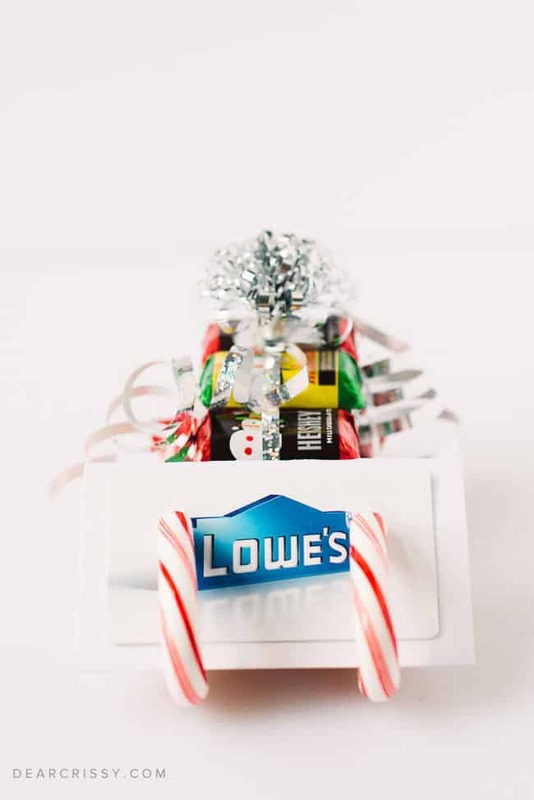 A gift card will slide perfectly into the front of the sleigh making it more than just a cute stack of candy. Your gift card will be #WrappedInStyle and ready to be placed under the tree on Christmas morning. 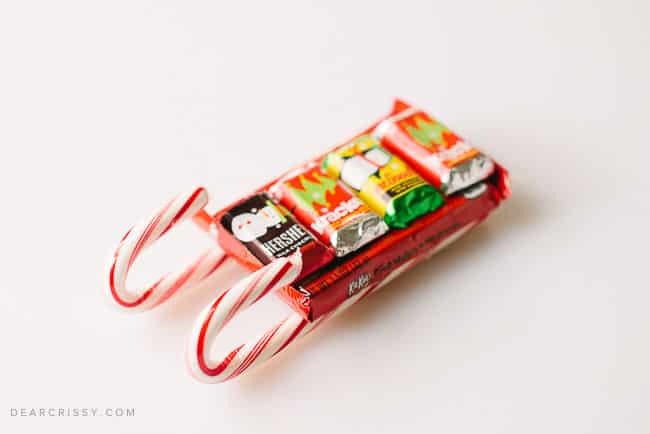 This DIY candy cane sleigh is also super easy to make and I love that. 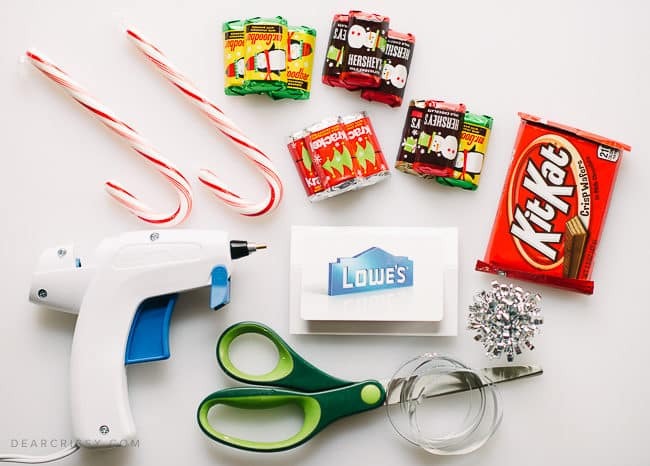 The full instructions and list of materials can be found below, but you basically just need two candy canes, a few candy bars, a glue gun and some ribbon to make a really cute gift. 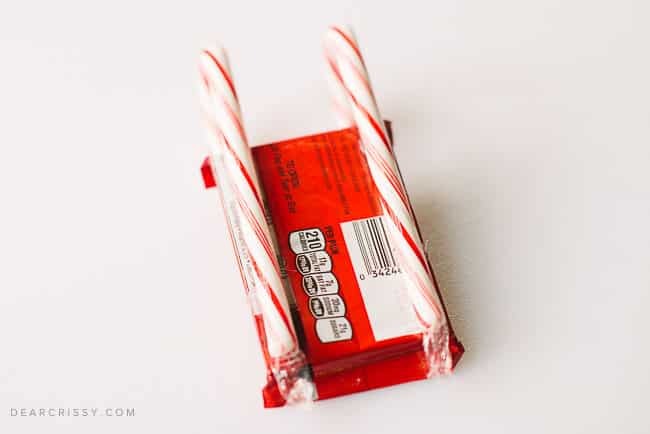 You start by simply hot gluing two candy canes to a regular size KitKat candy bar. 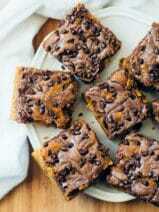 Then you’ll do a little layering with mini chocolate bars. Wrap it all up with some curling ribbon, just like a present. 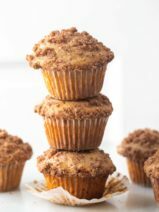 And top it with a pretty bow. 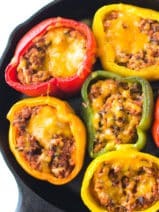 Of course, the best part of this DIY is the gift card! Choose your favorite gift card from Gift Card Mall. I chose a Lowe’s card and I plan to give this sweet little sleigh to my husband for Christmas this year. He’s the ultimate handy man and he can always use some spending money at Lowe’s. Some of my other favorite gift card choices from Gift Card Mall include: Kohls, Best Buy, Sephora, Sears, Amazon and Nordstrom. You can even make your gift card personal when you upload your own images to create Visa gift cards at Gift Card Mall online! This is just one way to wrap your gift cards in style this holiday season. There are really so many ways to add a personal touch to gift cards, and of course, you can always just include one in a special card with note from the heart. 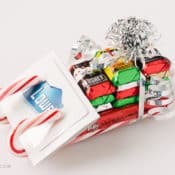 Check out the complete instructions for this fun DIY candy cane sleigh gift card holder, and happy gift card shopping! 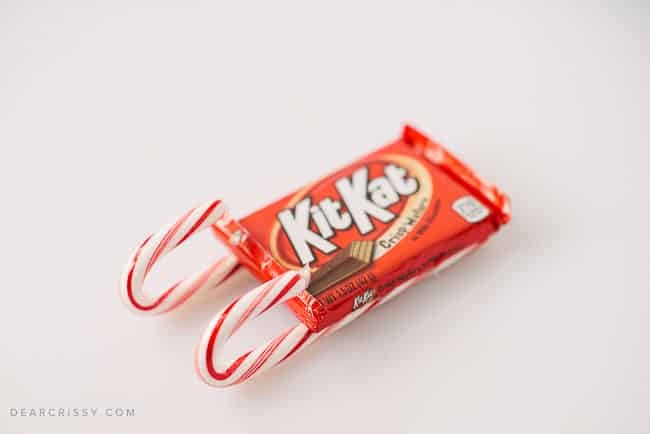 Using a hot glue gun, attach candy canes one at a time to the bottom of the KitKat bar. 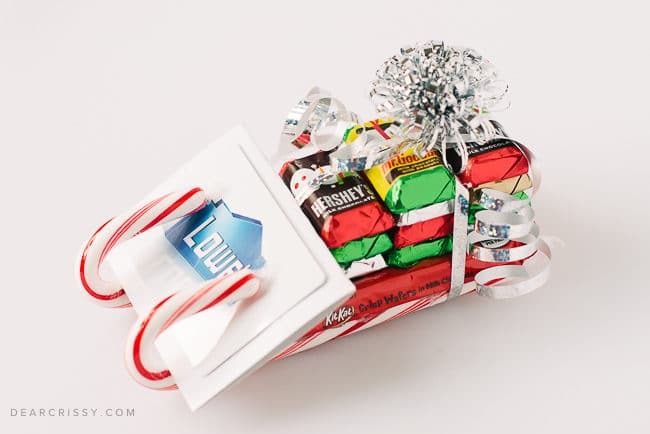 Attach miniature candy bars using a small drop of hot glue on each end of the bar. 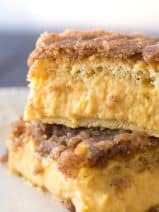 Start with 4 bars on the bottom row, 2 rows of 3, and 1 row of 2 on the top, toward the back of the sleigh. Add the curling ribbon just like you would wrap a present. Cross ribbon over the top then flip the sleigh over and crisscross, then flip back and tie in a knot or a bow. Curl the ribbon, add bow on top. Place gift card in the front of the sleigh, it will rest nicely leaning into the sleigh and under the bends of the candy cane. This is super cute and I am totally going to make for our nieces and nephew’s gift cards this year.